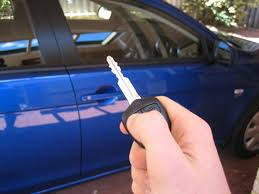 This week I’m going to take a look at a waking dream about a car key that wouldn’t work. As a reminder, waking dreams are unsettling or bizarre experiences that one has while awake. These experiences often linger in one’s thoughts and “won’t go away.” They can be analyzed the same as if they were the more traditional type of dream we have during sleep. That’s because they fall into exactly the same category of experience; they are simply dreams. I had a lunch date with a friend of mine, and I got into my car to go to the restaurant. I put my key into the ignition, but the key wouldn’t turn. After several attempts, I asked my husband to try. He examined the key and saw that there was transparent adhesive tape all over the key shaft. I have no idea how it could have gotten there. And since it was transparent, it was really hard to see. My husband finally got it off, but some of the tape must have gotten stuck in the ignition during my earlier efforts, because when he tried to turn the key in the switch, he had a hard time, too. After working the key back and forth several times, he finally got it to turn and the car started. I was late to my lunch date, but so was my friend, so it didn’t matter. The whole time we were together, I was worrying that I might have trouble starting the car when it was time to go home again. This dreamer then had a similar experience a few days later: A visiting family member couldn’t get her car started, either, this time with an ignition-less starting system. The fact that the event occurred twice made a strong impression and prompted the dreamer to relate her waking dream in class. I’m going to focus exclusively on the first experience because I want to make a point about the importance of examining all of the symbols in any given dream. If you look carefully at the symbols in the italicized paragraph above, you can see that some of them seem apparent without too much examination: Not being able to get a car—a vehicle—started because the key doesn’t work, is metaphorically pretty straightforward. What made the dream perplexing to the dreamer is that she is an extremely creative and self-motivated individual. Nevertheless, when she took note of what was going on in her life during the time when the dream occurred, she did see that she was trying to organize a class. The class wasn’t coming together due to scheduling conflicts, and she was spending an inordinate amount of time on the phone trying to make it happen. So far so good, but she felt that there was more to the dream message than simply making a point about how hard it can be to organize events. We’ll take a closer look during this week.